RUSH: Sarah Huckabee is doing the White House press briefing today — Sarah Huckabee Sanders — and she is doing a phenomenal job. She is no nonsense. She is confident. She’s unflappable. These people are not in any way, shape, manner, or form rattling her at all. I want to give you an example of something that… They’re asking her the same question over and over. “Why did Trump say a week ago that he had full support for Comey and fired him yesterday? Huh? Huh? Did Sean lie to us last week about that?” ‘Cause Spicer said that. She just looks at these reporters and smiles, and said, “Yeah, you have to get that little dig in. No, of course not,” and then she answered as she has been answering. She went back and talked about how Comey has broken with the chain of command, started assuming control over the Department of Justice when it wasn’t his. She made mention of the fact that his vastly, greatly erroneous claim last week under oath that all kinds of classified documents and emails were being uploaded to Anthony Weiner’s computer by Huma Abedin, when it wasn’t the case. They characterized it as Sarah Huckabee Sanders trying to say that they’re rattled by it and they hope you guys will finish this so we can be exonerated quickly. It’s just… It’s subtle and it’s snarky, and it ticks me off like I can’t tell you. She’s just trying to answer the questions as best she can. She’s not engaging in any spin. She’s not being impolite or rude in any way, shape, manner, or form, and she’s not flappable. She’s not been caught up. She hasn’t paused. She hasn’t misspoken. She hasn’t had to go back and correct something, and I’m sure it’s irritating them. But I’m telling you: I’ve been trying to remember during the break if I can recall a political hoax like this, because nothing’s new in the world. Nothing’s new since Genesis. And so everybody in their life thinks history began when they were born. Most people’s historical perspective happened when they were born in the sense that nothing has ever been this bad. “We’ve never gone before this before,” and of course we have. Things have been worse in many ways in the country. But that notwithstanding, I’ve been trying to recall any remembrance of a similar kind of political assertion. Maybe the Valerie Plame leak. That was frustrating because we knew who the leaker was and the special counsel didn’t care, and was hell-bent on nailing somebody in the administration. But that was not quite like this. There have been similar things. I mean, the Democrats wouldn’t let go of the war in Iraq and did everything they could to propagandize that. But this is a nothing burger. There literally is nothing there. There is no evidence. There’s not a single person in the world who’s ever said there might be, much less is. Maxine Waters is the latest. Do you know she has become the biggest star in the Democrat Party with Millennials? You know, Mr. Snerdley, do you know that she was the big draw at the MTV Music Awards? Maxine Waters got the biggest standing O of anybody at the MTV Music Awards! I think they were Sunday night. They call her Auntie Maxine. You know what they like about her? She’s been talking about impeaching Trump. You know, she’s insane herself. She’s a literal lunatic. And they’re eating it up. You know, the Democrats have to slap her down and say, “Maxine, come back down here. We don’t want to admit that.” But I can’t think of a hoax like this. Maybe you can. I mean, a nothing burger. But even Maxine Waters said no! Dianne Feinstein said: No evidence. Remember Wolf Blitzer was crestfallen when she announced to him last week when she said no evidence of collusion? And they all followed up with, “This is why we must continue investigate.” And it’s a classic arrow from the quiver the Democrats have. It’s a classic arrow from the quiver they have that if there’s no evidence, it means there’s something there! “No evidence” means, “By God, it’s there! We just haven’t been able to find it! No evidence? We really need to double down on our investigation!” It’s an offshoot of “the nature of the evidence” is not what’s important; it’s “the seriousness of the charge” that justifies this obscene pursuit. SANDERS: He wants them to continue with whatever they see appropriate and see fit, just the same as he’s encouraged the House and Senate committees to continue any ongoing investigations. Look, the bottom line is, any investigation that was happening on Monday is still happening today. That hasn’t changed. And, in fact, we encourage them to complete this investigation so we can put it behind us and we can continue to say exactly what we’ve been saying for nearly a year: There’s no evidence of collusion between the Trump campaign and Russia. And we’d love for that to be completed so that we can all move on and focus on the things that, frankly, I think most of Americans are concerned with. 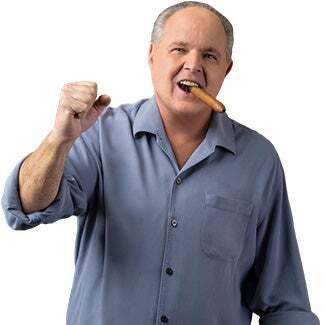 RUSH: And CNN got all snarky here and on their graphic, they tried to make a point that Sarah Huckabee Sanders said, “We want to put this behind this because we’re guilty and we want to get away with it! We want put…” She was simply saying (paraphrased), “Would you guys wrap this up? You’ve been looking at this for a year! There’s nothing here. We can’t wait ’til you wrap this up so we can move on.” They don’t want to wrap it up, Sarah! They don’t want an end to this. That’s the whole point. It’s a political story. It’s not an investigation. They don’t want it to have an end. Blake Burman, White House correspondent: “What happened yesterday you could argue just widened the divide and made D.C. politics more toxic,” this firing. “So how do you go about accomplishing all of those things on the presidentps agenda with” this kind of environment? RUSH: There you go! White House before he is briefing, Sarah Huckabee Sanders.